The gold market is up a little, a mere 100 points to $1836. The metal remains well supported as long as the economic data continues to disappoint to the downside and especially for as long as the Eurozone crisis rumbles on. This is seen as the main contributing factor to the strength in gold and not the increased prospects of another round of QE from the Fed. If QEIII does become even more likely then we could see the $2000 targets many bulls have taken out sooner rather than later. Gold had a mild profit take yesterday and this morning is at $1823. The long term uptrend remains very much intact for the precious metal but trading it has become very difficult, rather like the equity markets. The more investors believe there's going to be further QE from the US, the more gold prices will be supported. Over the near term $1840/55 are seen as resistance with $1810 and $1770 being support. Brent crude oil has also oscillated around current levels and is at $114.00 this morning. Rather like gold, the black stuff has yet to break down its long term uptrend. In the broader picture it looks to be forming an upward flag, which for crude oil technical analysis followers is a signal for further advance ahead. Upside targets for Brent are $115.40, $116.40 and $118.00 with $112.50 and $111.20 to the downside over the near term. Last night's FOMC minutes did little to offer more than what the Fed's Chairman said last week at Jackson Hole. As a result, investors are now looking to the next FOMC meeting which is in the latter half of September. The CFD markets have had a massive shake out and corrected to the downside due to the revisions downwards to global growth. However at the moment any bad economic data seems to be followed by equity market strength. This indicates that investors are pinning their hopes on another bout of QE from the Fed, which in turn is boosting gold prices. As mentioned, gold was boosted by the bad data and we can probably expect further strength from the commodity if the data remains poor. A little bit of profit taking this morning brings us to $1829 so near term support and resistance are seen at $1810, $1770/42 and $1855/71/95 respectively. Gold has certainly seen as much volatility as the equity markets in recent weeks with increased margin requirements from the underlying exchange contributing to the major swings. Gold is creeping back towards $1800 this morning in a quiet session so far, but the moves over the last few days show just how dangerous dabbling in commodity markets can be. Even a small position can see large swings in and out of profit when the market is really moving. 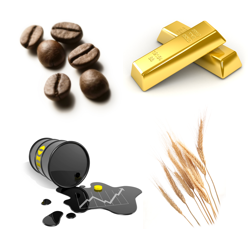 Crude oil spread betting prices are also a little higher in line with gold, with Brent at $112.20. The fact that it bounced so aggressively off $100 a couple of weeks ago indicates that there are still plenty of buyers of the black stuff out there. However, the recent lower highs and lower lows since April is a cause of concern for the bulls. Gold is rallying strongly now after all the sell offs of the last two sessions. Last week if you had said 'gold will be at $1790' next Friday nobody would have blinked an eye. However, in the meantime it has been $120 higher than here and $90 lower. This might rather blind us to the fact that this was just a period of extreme volatility rather than, as some were thinking, confirmation of the end of the bull run. Personally, I do not believe in happy endings so I would not be surprised if we have another fierce sell off to hammer those buying into these falls but this is just speculation. The spread betting chart shows us that resistance for gold is now at $1792/96 and then $1815/17 whilst support is at $1778/80 and then down at $1754/56 and $1732/34. The gold spread trading market finally had a bit of a mare yesterday, falling almost $100 from its previous day's high. It has bounced this morning but this is a timely reminder that gold is actually a pretty valueless product of only real consideration as an indication of confidence. If the world decides that spending a fortune for zero yield, the only realistic potential capital appreciation is built on a fear of everything else, then the bottom could be a long way down. As we have mentioned over and over though, the bulls still have the upper hand and trying to actually stand in the way is a dangerous game. Yes the shorts had their day in the sun yesterday but it takes more than one session to turn a market. Much to the bears' dismay, the steam that powers the gold rally is far from running out. Yesterday the yellow metal surged past the psychologically important level of $1900.0, and even touched on $1912.2 before coming to an end $57.4 higher at $1909.0. The concerns that appeared to be at the forefront of investors' minds were debt, inflation, unemployment and housing and even the low expectations of additional stimulus powers dragged the buyers into the precious metal. At time of writing though, the bulls seem to be taking a breather as gold is trading down at $1877.5. US crude oil extended its recent gains, with the equity markets strengthening, and ignored the slight advance in the Dollar which normally puts a ceiling on the energy sector. The events in Libya did however put downward pressure on Brent, with expectations on an increase in oil exports. We are seeing buying on almost all fronts from gold to crude oil and back to equities and stock market indices. The gold spread trading market has spiked higher this morning but it is difficult to get excited about the yellow metal at the moment. With every asset class in the world coming under pressure, the flight to quality argument is becoming harder to support. The only argument in its favour is 'that there is not much of it about'. However, the same argument could be used for quite a few assets, power production facilities come to mind, but these are all falling in line with everything else. Our comments have been clear that it has been foolish to stand in the way of the gold bull run as every indicator seems to be pulling it higher. Nevertheless at some point the argument begins to turn for the Longs as well. The upside is beginning to look less certain the higher we go and the view from our current level shows that there is a long way down to worry about.